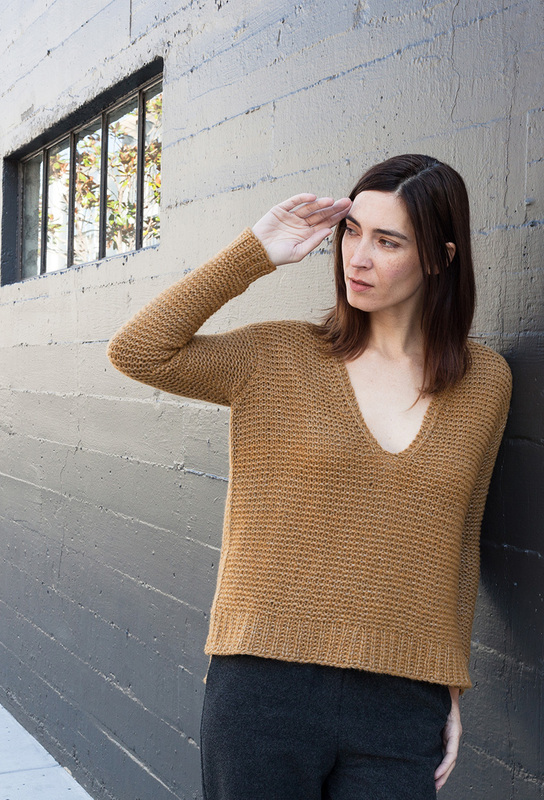 But GULD is also my new deep V-neck pullover design for Woolfolk LUFT collection, that just launched on Earth day. I feel lucky to be in this group of talented designers showcasing Woolfolk’s brand new yarn called LUFT, literally meaning “air” in Danish. And it, in fact, feels just like air! What strikes you right away is the juxtaposition of bulky gauge yarn and how extremely lightweight the yarn feels in a skein, but also the feather light garments it produces. And that makes you really wonder what is this yarn and how is it made!? LUFT has an unusual construction of organic pima cotton cage or a tube that gives that crisp feeling once you handle it, but the inside of that tube is still filled with amazing Ultimate Merino® fibers! Once you have worked through the skein or two, you experience this deja vu feeling as if you are working with cotton, except you are not, not really. The “hand” of this yarn is truly unique, you feel you are being constantly deceived whether it’s cotton as you might feel the subtle grab on the needle, except the peeking through fibers help it move along and knit up very fast. Once washed and blocked the yarn blooms even more, the tube allows just enough of the fibers to show and bloom through, and the difference in color of the cotton and the fibers create this really dimensional effect in the finished garment or accessory. Just like in my GULD here, the color is L.04, the cotton tube is of medium grey hue, while the fibers inside are vibrant ochre color, and when mixed in they produce this muted, complex, yet sophisticated color. I wanted to create a sweater design that would feature the most qualities of LUFT and to do that I have chosen to create an updated classic pullover. V-neck is deep but easily can be layered with a camisole underneath. Slipped garter rib trims and all over garter stitch give it this sumptuous all over texture. But modern fit and updated details turn the process of making it fun, while still keeping it as an intermediate level project. Front and back have a little bit of hem difference and a split. Both are worked flat, then seamed at the shoulders with an exposed seam. The sleeves in turn are shaped in the round with sleeve cap for a modified drop shoulder, which is then set in using Mattress stitch. Same seaming technique is used for the side seams. And with subtle positive ease, this pullover is really great for several of the seasons and the transitional weather, whether layered or worn on it’s own, it still feels light as air.